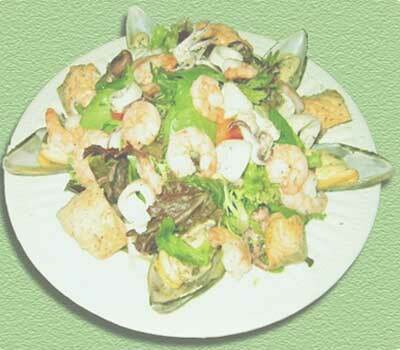 Seafood dishes are dishes that consist of preparations of edible fish. These are so great for the tastebuds, aren't they? We have brought some great seafood recipes for you. Have a look! If you like reading these, imagine how nice you'll feel when you taste them. So make haste and prepare them at home. If you want to share these with someone, click here. Cook and stir margarine, onion, salt and pepper over medium heat until onion is slightly tender. Blend in flour. In a large pot of salted boiling water, cook pasta. Thereafter, rinse under cold water and drain. Bring a large pot of lightly salted water to a boil. Add pasta and cook for 8 to 10 minutes. Rinse under cold water until cool and drain. While pasta is cooking, chop celery and crabmeat. Run hot water over peas to defrost. In a large bowl, whisk together the mayonnaise, sugar, vinegar, milk, salt and pepper. Add the pasta, celery and crabmeat and stir until evenly coated. Adjust the salt, sugar or mayonnaise to suit your taste. Chill several hours before serving.